The first six paintings in Edvard Munch’s Frieze: Cycle of Moments from Life, exhibited in Berlin in 1902, covered the Seeds of Love, and ended with Madonna (1894). That provided the transition to the next section with its conflicting themes of saint, whore, and abandoned lover. In these next six paintings, Munch continues his botanical metaphor with the Flowering and Passing of Love. Edvard Munch (1863–1944), Ashes (1895), oil on canvas, 120.5 x 141 cm, Nasjonalgalleriet, Oslo. Wikimedia Commons. A woman stands, her white dress unbuttoned down the front to reveal scarlet underclothing. She looks directly at the viewer, her hands in her long locks of hair, which stream in serpentine curves like Medusa’s. In front of her, a man faces away, his face buried in his chest, and his hand clasping his head, shunning the woman behind. The scene is set in a dense and dark wood. 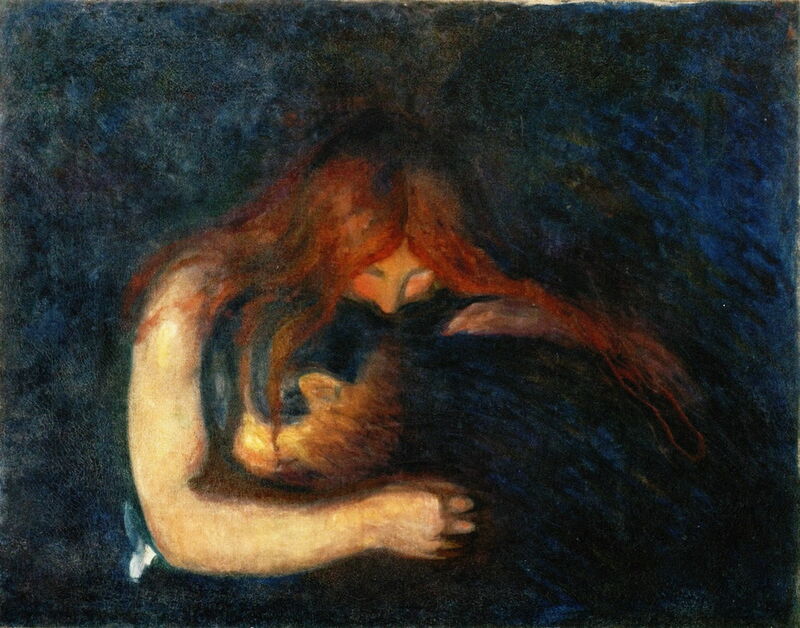 Munch wrote an autobiographical note in his diary, which relates this painting to an adulterous relationship, in which he felt stifling despair after making love in the evening. He uses his established colour-coding to indicate the change in the woman and their relationship, from the white innocence of initial love, to the scarlet of lust and the carnal. In the title, the artist draws the inevitable parallel with the Fall of Man. 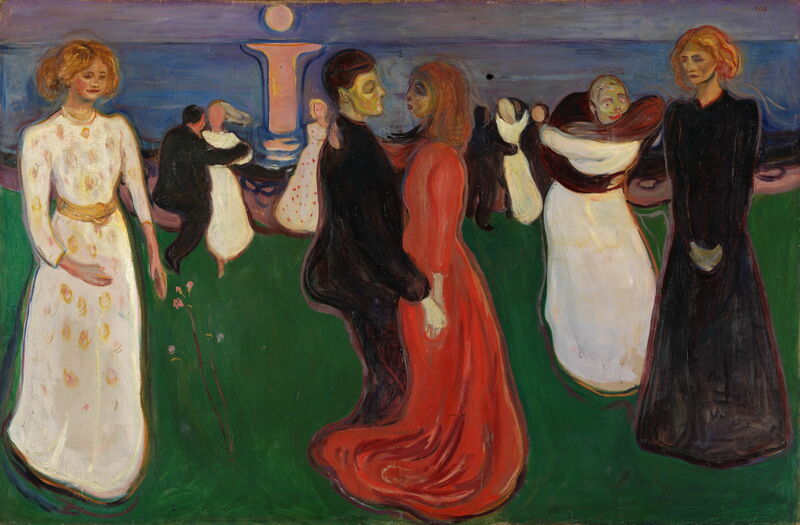 This is one of Munch’s most consistent and persistent motifs in his series, which was included in his first series of Love paintings in 1893. Although it exists in several versions, his composition remains unchanged throughout them all. The lovers are now embracing, but not in a conventional way. She holds him and bends her head down, as if to bury her teeth in the back of his neck, like a vampire. This is a kiss with a menace, one which will allow her to feed off him. The femme fatale had become very popular in the arts in the late nineteenth century, particularly with the revision of the story of Salome and John the Baptist expressed by Gustave Moreau and popularised by Oscar Wilde’s play Salomé. Today the concept may seem misogynistic, but at the time it was more complex and in some respects empowered women. The version of this painting now in Gothenburg, Sweden, was probably that shown in the Frieze. The contemporary version shown above is almost identical, but my personal favourite (shown below) was painted just a year or two later. Edvard Munch (1863–1944), Vampire (1895), oil on canvas, 91 x 109 cm, Munchmuseet, Oslo. Wikimedia Commons. 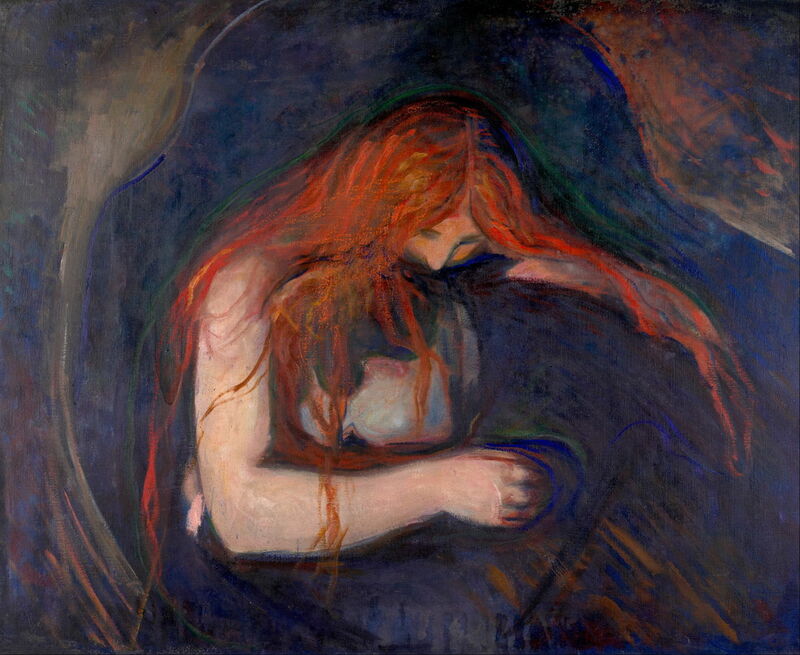 This was another of the paintings made by Munch to enlarge and enhance his original Frieze to its 1902 form. It shows the artist dancing with his lover ‘Mrs Heiberg’ (Millie Thaulow), who is depicted as a mature and passionate woman in red. However, Munch’s figure is stiff and his head disengaged. In the background, the moon and its reflection form an ‘i‘ which echoes that in The Voice. To the right is a man engaged more passionately with his partner; this is thought to represent the writer Gunnar Heiberg. One woman, who lacks a partner, is shown twice, at the left and right edges: she is Tulla Larsen, Munch’s later lover. At the left, she reaches out towards the flower of love, which will not let itself be taken. At the right, her hands are clasped in front of her in acceptance of her rejection. 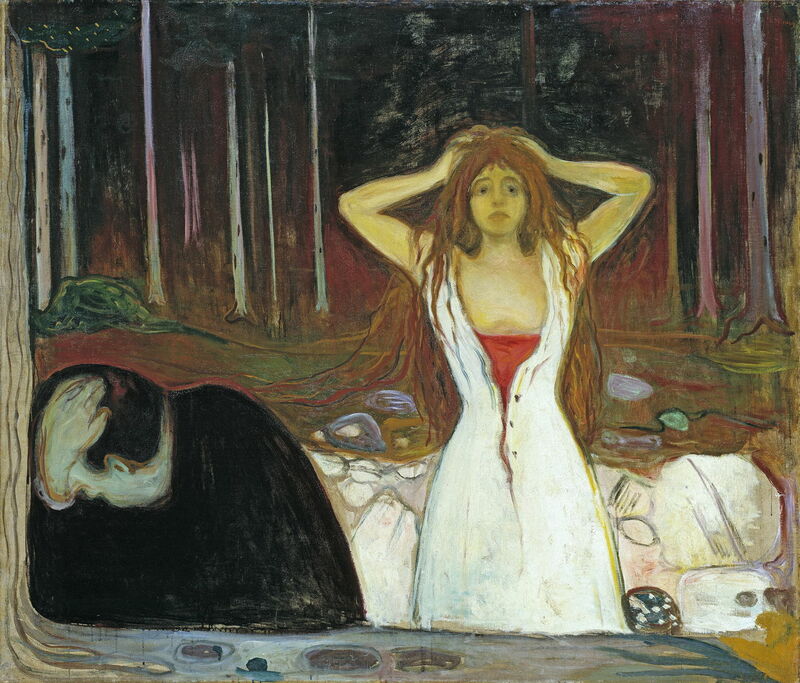 This multiplex narrative therefore shows Munch’s two failed relationships: with Millie Thaulow, who rejected him, and with Tulla Larsen, whom he rejected. It thus brings this series of images to a point of crisis. 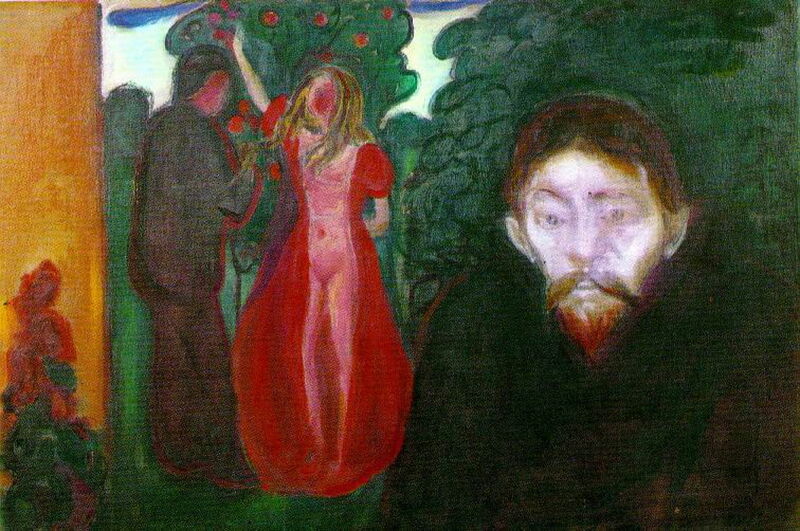 Munch takes us on to Jealousy (1895). Eve, standing in the background with her scarlet dress open to reveal her body, is reaching up to pick an apple for Adam. The satanic face at the right looks directly at the viewer, his jealousy made obvious. This painting formed part of an artistic dialogue between the writer Stanislaw Przbyszewski, model for the face at the right, and Munch, who was having an affair with Przbyszewski’s Norwegian wife at the time. Przbyszewski responded by writing a jealous painter into committing suicide, in his novel Overboard (1896). 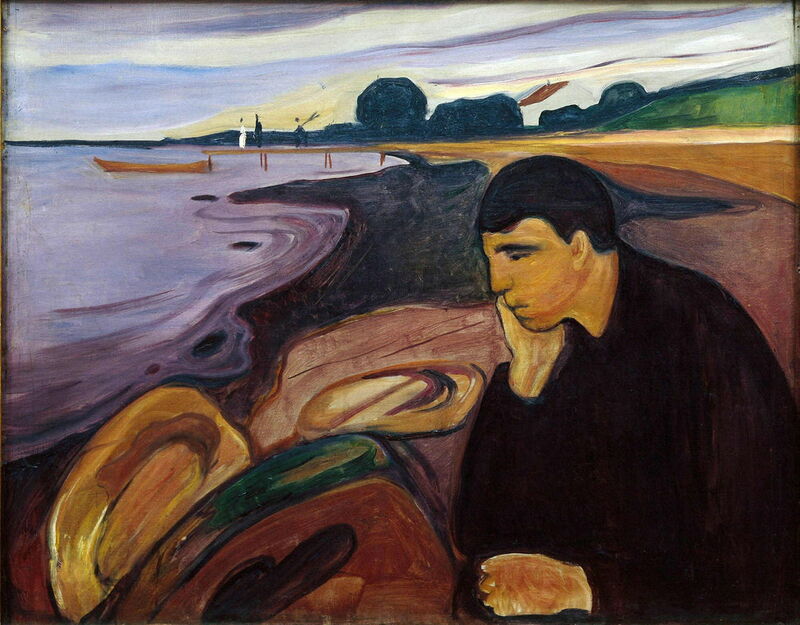 Munch reversed this image in lithographs which he made in 1896, and later adjusted his composition – a process similar to that used by the Norwegian landscape painter Nikolai Astrup to develop his paintings. 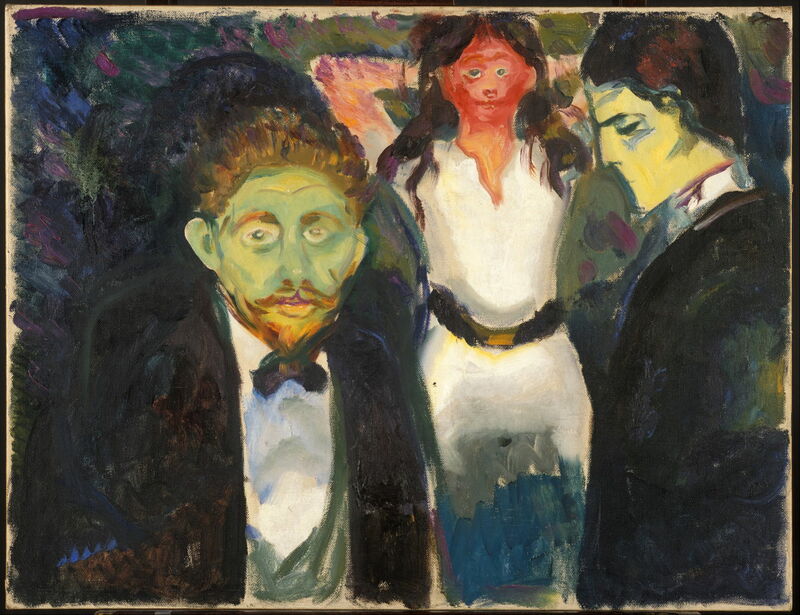 In 1907, he made a second painting of Jealousy, shown below, in which the reversal is apparent. Edvard Munch (1863–1944), Jealousy (1907), oil on canvas, 75 x 98 cm, Munchmuseet, Oslo. Wikimedia Commons. All others are one – you are a thousand. In the play, a woman has three lovers, and manifests herself to each with a different personality. Munch’s original title Sphinx refers less to the mythical monster than to its connotations as a femme fatale, and the artist also referred the women to the Norns, Nordic versions of the Fates. 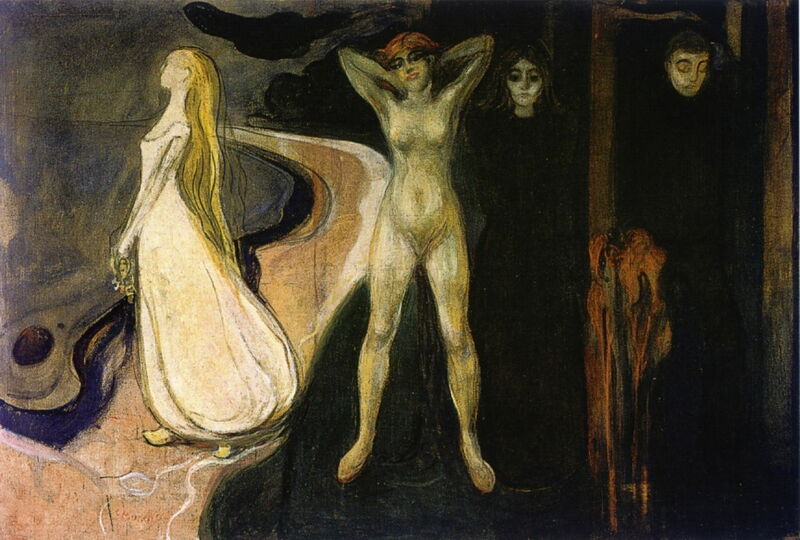 Here Munch shows three women: a young idealised romantic on an undulating bay (white dress), a naked femme fatale (red hair), and a shadowy matron (black dress). At the right, a man stands, his face cast down in dejection. It is a series within the outer series, a frieze in its own right. The outcome is melancholy in solitude. The man is sat up, his chin buried in the heel of his hand, morose. Behind the coastline undulates about an arc which ends in a sliver of flat land marking the horizon. He is on his own. Three figures in the distance walk along a wooden pier to board their boat. Above there are undulating banks of grey cloud which sweep across the sky. Munch’s figure was based on a friend, an aspiring author, who had had an intense and ultimately tragic affair with the wife of Christian Krohg, Munch’s teacher and mentor. This completes the second section in the Frieze, and provides the link to the next, titled Life Anxiety.